I’ve been meaning to post on the topic of jaundice for a while, but I’ve finally been spurred to do this by a recent post at Left Brain / Right Brain. That post gave a nice summary of the current scientific wisdom about a link between jaundice and autism, concluding that at this point in time there’s no strong evidence for one. I had a very emotional time dealing with jaundice with my newborns, and as a desperate mother I even blamed it (and in-turn, myself) for my son’s autism – that was before I’d ever heard of research into such a link. So I think it’s topical that I share my story. I had a difficult pregnancy and birth with my autistic son. (That story in itself is too long (and upsetting) to be thrown in with this jaundice story – I’ll deal with that separately in a future post). Those difficulties had left me feeling incompetent as a mother, even before I was one: I can’t even get pregnant and give birth without stuffing up, how can I possibly parent? Add to these irrational thoughts, the utter exhaustion and extreme blood loss, and it’s not too surprising that I reacted as I did when I received that phone-call after finally getting my new-born son back home. My midwife called to say the blood test that had been taken before we’d left for home with our son, showed his jaundice was severe enough that he had to be put “under lights” back at the hospital. I just went into uncontrollable tears, and pleaded with her to tell me what I’d done wrong – why did my son have jaundice? She explained it wasn’t my “fault” but didn’t seem interested in dealing with my emotions, just in getting the baby back into hospital. So my baby and I went back to hospital, and they put him under lights, and it broke my already fragile heart. He was placed in the incubator, significantly sound-proofing him from the world. His eyes were covered, so he couldn’t look around either. I had to leave him in there as much as possible, so he wasn’t getting cuddles and touches, except for the breastfeeding. It was sensory deprivation on a range of levels, and it just felt and looked wrong. There are significant risks with jaundice though, so it had to be done. He also came out of that incubator for regular blood-tests to see if his jaundice was improving. Hardly a pleasant and loving start to his life. A couple of days in there and his jaundice was improving. But I was going insane, and increasingly desperate to just be able to hold my son when I wanted, and take him home. They decided his jaundice was to the level that he could be taken out from under lights, but it was made clear to me that this decision was more to do with the fact that there was a shortage of phototherapy incubators and another child’s jaundice was worse than my son’s currently was. So we were told we still couldn’t leave the hospital, I had to keep his cot by the window to get what little sun he could that way (sun exposure being the regular way to combat less-severe jaundice). They told me to wait on one last blood test, and that would probably show he was OK to leave by the end of the day. They’d get back to me within two hours. Five hours passed. I made enquiries, what was going on? Where were the results? They told me to be patient. About another two hours passed, I got stroppy. I wanted to know what the hell was going on. They admitted that they had lost the blood, and were trying to find it / the results. I had had enough – my son wasn’t even under lights, what was the benefit of being there. With the support of my husband, I took my baby and left the ward, saying I’d come straight back in to hospital when they found the results, and if they showed my son required more lights. They finally took us seriously and gave up on the missing blood test, and gave us an immediate blood test and result (it only took a few minutes); our son was OK to go home. That was largely the end of the jaundice issue – there were just more blood-tests and home-based measures. Years later I would wonder what impact that early sensory deprivation had had on my child. Rationally, I knew the answer was likely to be “none”. Emotionally, I was still raw from the whole experience. When I was pregnant with number two, I asked the midwife if there were any known factors for pregnancy and birth, that increased the likelihood of autism. She mentioned that jaundice came up in the literature. My heart just sank. Great. She gave me all the medical journal articles to read for myself, and I reached the same conclusion she had – it was an unlikely link. It was also unclear from the research whether it was the jaundice or the treatment of the jaundice that was the problem (though it was more likely to be the former if it was either). My second son was born (after a normal pregnancy and birth), and he got jaundice. Because of the emotional toll of putting a baby under lights in a hospital – instead of having him at home with me – I fought to do anything and everything to not have him go under lights. I also couldn’t simply forget what I’d read about jaundice and autism. I breast-fed him like crazy, and I exposed him to sunlight whenever possible. His bloods showed he was at the point where it would be best for him to go to hospital, but I wanted a second opinion this time. I was told I could keep him at home, on the condition he got a blood test every morning to monitor him for now. The bilirubin level peaked then slowly, steadily, fell. The jaundice had been bad but we’d managed to keep him out of hospital. As it turns out, my eldest has autism, my youngest doesn’t. But I don’t make that tempting and popular error of thinking my anecdotes prove anything. They are just part of the story of my sons’ lives. I got over blaming myself for the jaundice, and I got over blaming myself for my son’s autism too. These things take time. Getting over those feelings and thoughts also required information about both autism and jaundice. Maybe a strong link will be shown in the future, and then maybe they will figure out how to address the link, if it can be addressed at all. All of that appears unlikely for now though. I would be very interested to hear your own jaundice / autism stories too. Sharing made me feel better, maybe it can do the same for you. This entry was posted in Causes and Cures of Autism and tagged ASD, Autism, Breastfeeding, Health, hospital, Jaundice, neonatal jaundice, newborn, phototherapy, under lights. Bookmark the permalink. Hi, sounds you like youv’e had a rough ride into parenthood. My son was ASD from the day (well probably before) he was born. No regression. Just that way from day one. No jaundice. Not even a tiny bit. Hi shazza. I firmly believe the same of my son – and have evidence to think so – that he was autistic from birth. There was no sudden turning point, he was always developmentally delayed and “different”. It doesn’t stop you wondering of course – about risk factors making it more or less likely – and when new information turns out purporting to show a link it’s a good idea to read about and research it. My daughter too… If not from birth, then from a VERY young age. I see videos of her at 6-8 months old (now) and always say if a PT had gotten their hands on her then she’d have probably qualified for services then. Yep Iv’e agonized over things I was exposed to during my pregnancy that might have flicked the switch, so to speak. But I have come to believe that my hubby and I just make quirky kids. My ASD son does not stim or have any obvious sesnsory processing issues, yet my NT daughter does. No jaundice with her either. My dh and I recently did the Autism Quotient online test and we both scored highly. No surprises there. BTW – The title of this blog is one of my faves. My daughter didn’t have jaundice, my niece did. My daughter is on the spectrum and my niece isn’t (though she does have fine motor and speech delays). Like you, my pregnancy with my daughter was rough. Hyperemesis throughout the entirety of the pregnancy. I was hooked to an I.V. at home for 5-6 weeks. And on anti-nausea medications, which only served to take the puking form 12x per day in the beginning to about 1/2 that…. by 9 months I could eat, but would still vomit at least 1-3x per day. And then, I gave birth. And we were about to go home… and though I had no pre-eclampsia… I had Eclampsia. In the hospital. On the day I was to go home. SHE was fine. But WE had to stay in the hospital for an extra week (and if you ever want to feel like a circus freak have a seizure in a maternity ward)… and for the first months of her life, Hubs was so freaked that I couldn’t hold her without another person in the room (or stand up with her or…. well anything). So yeah… guilt? um hmmm… gotcha. I don’t talk too much about it. But truth is, lately (or all winter.. I don’t know) I’ve been feeling like one big walking raw nerve. That post just sort of hit the nail on the head. I thank you for the shoulder/ear/outlet…. Also, I think difficulty (as well as other genetic traits) with pregnancies runs in my mother’s side of the family. My cousin had 2 pregnancies pretty much just like mine (not so much the delivery)… but her daughter had ongoing respiratory issues and was just diagnosed w/celiac, her son has kidney issues that are long and ongoing. (diagnose in utero) I have no idea what if anything this has to do with the type of pregnancy … but I can believe it does. I guess everyone always wonders if there’s something they could have avoided/prevented/treated differently that would have lessened or completely removed their child’s autism. I have my own pet theory. If anything my pregnancy, birth, and jaundice stories are classic counter examples of any link between medical issues therein and autism. My pregnancy with my oldest was “perfect” – I had minimal morning sickness, ate well, took my pre-natals, delivered her naturally without any drugs, breastfed from day one and held her a lot trying to get her to eat (early oral motor issues!) and sleep (early sensory issues!). She had little/no jaundice. In retrospect she had warning signs of autism from very early newborn days. My pregnancy with my twins was rough – pretty bad morning sickness for 3 months, couldn’t tolerate the pre-natals, put on bed rest at 27 weeks due to early labor, took all sorts of medications related to that and the infection that started it, gave birth by c-section at 34 weeks and they spent 3 weeks in the NICU, part of that time in incubators, and/or under bilirubin lights because they were both jaundiced. Although we fed them breastmilk I could only nurse them a few times a day because I was also trying to reconnect with my oldest who I had basically abandoned for 7 weeks. Although they are only 3 yo, they appear to be neurotypical. Little boy has some phonology issues, but otherwise their language is normal, and their social skills actually are better than their older sister at this point. Personally I think there are several disorders currently lumped under the term autism because they all look similar. I think each of these probably has a different root cause, and I think genetics is probably a key factor in each. There may be an environmental trigger(s) but I don’t think that will be completely understood until we understand the genetics more. Hi my son had jaundice when he was born stay in hospital under a lamp for 4 days regular blood test too. He also had very low vitam k ! When he was discharged they give him medication to take for a month afterward and had to see a specialist for more blood test but all came back ok! My son is now 3 and as autism I have been doing research to find out why he as got it, until I came aross reading what you put and other finding I think this makes more sence then anything eles I have read ! My 6 year old son has high functioning Autism and had severe jaundice at birth. I have always believed that there was a connection. My guess is that the genetics were the loaded gun and the jaundice was the trigger. Which is probably why there is not a ton of research to prove the connection. My second son had very mild jaundice and does not have Autism. My son with Autism did not say a word until 3, and is now 6 and in general ed. first grade and doing well. Even with a high functioning child, it has been a rough and emotional road! Like you, my son had 2 return 2 hospital at 5 days old after he was sent home on the previous day with Bilirubin levels just below danger point. He was tested the following morning by district nurse. 5 hours later we were called telling us that our son’s level had risen. We were 2 return 2 hospital as soon as possible. A further 5 days of intensive phototherapy treatment & he was allowed 2 go home. At the age of 4 years, we were told that our son was on the Autistic spectrum. He was then given a formal diagnosis of Aspergers syndrome at 7 yrs old. I have always suspected that the severe jaundice was linked to ASD. Hi, I was severely jaundiced at birth, lived my first couple of weeks in an incubator, and have AS. Hi. Reading your story made me realise we weren’t the only ones to go through this trauma. My son was born after a normal pregnancy & straight forward birth. After 2 days of thinking my baby was ‘well-tanned’, I was told that he had jaundice. “Keep breastfeeding your baby & he’ll be fine”, I was told. On day 4 they told me I was going home. My son hadn’t received any phototherapy treatment at that point. The midwife told me that my son’s bilirubin level was very high & needed to come down urgently. So they sent me home the next day & arranged for a community midwife to do blood test next day. I wasn’t to worry as the level was bound to come down overnight. Next day, after the test, we called the nurse for results: his bilirubin was above the danger level.. We had to bring him back to hospital at once. He received treatment until he was 11 days old, when we were told he could go home. At 4 yrs old he was diagnosed with Autistic spectrum disorder & to this day, I believe there is a link to his jaundice as a baby. Hi. I read this post a number of years ago but didn’t post a response despite it and the comments resonating deeply with our experience. I thought at the time my concerns about my son’s extreme neonatal jaundice was more an example of parents of children with autism being neurotic about causes. My sons autism/intellectual disability has had a huge impact on our lives but all the specialists we have consulted (including a geneticist who conducted extensive genetic testing) have come up with nothing definitive about the cause. No one seemed remotely interested in our theory that the jaundice was the culprit apart from the treating paediatrician (that however is a long, complex and emotional story). That said 8 years ago, when we began out search for a cause for our son’s increasingly obvious developmental delay, the evidence for jaundice being implicated in autism was not strong. One high profile study amongst children with extreme and dangerous levels of jaundice found no evidence of any harm at all looking at all possible adverse developmental and health outcomes. They didn’t even find kernicterus – a rare outcome of jaundice related brain damage – even though some children they were tracking had levels that were “off the chart”. This has recently been re-confirmed in another large study that looked at the issue using a similar methodology. However a few more studies post 2011 are suggesting that jaundice, autism and/or intellectual disability are linked. As this systematic review makes clear (http://www.ncbi.nlm.nih.gov/pmc/articles/PMC4285414/) the parts of the brain that jaundice commonly effects are implicated in autism. 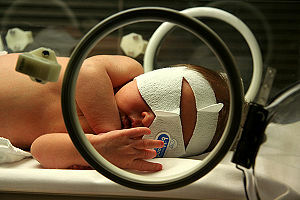 So there are good reasons for continuing to study a link between jaundice and autism. However this review concluded somewhat meekly that there was enough evidence to look for more evidence of the link! So four years on from your post the picture is still confused but I think that its tipping towards jaundice being involved. What should a parent do with the coincidence of jaundice and autism in their child? Probably not get too obsessed about it (as I have) as scientists will always disagree and evidence will always conflict. But the stories on this blog about jaundice are important and perhaps should be taken more seriously by the medical profession! BTW your blog is great and really covers well a lot of the issues we have faced as parents with autism. Last sentence should have ended “parents of a child with autism”. I have asperger syndrome (no developmental delays). I did have jaundice as a newborn and was in an incubator under lights for 10 days or 2 weeks or something like that during which time my parents weren’t permitted to hold me. However, my dad is more obviously “autistic” than I am so I have no doubt at all that I inherited asperger’s from him, and that he inherited it from his mother who similarly was asperger-seeming. It is known that asperger’s is strongly genetically linked. I suspect that sensory deprivation as a newborn probably isn’t helpful to the good development of someone who is born on the autism spectrum (or anyone else), but I personally don’t think that going through jaundice treatment actually caused my autism spectrum disorder. Sometimes I experience cravings for contact and touch especially when anxious but I am able to manage these feelings healthily as a chaste single person and as someone who is not touchy feely. I am Catholic and prayer is deeply important in my life, and this is also a profound personal contact, and although this is obviously it is a spiritual contact the consolation can overflow as a comfort for the body too in the loving Person-contact with God in prayer. This is true, and understanding ourselves as made for relationship both with other humans and with God is part of understanding our nature as human. What a person languishes without is personal love, simply a mechanical effect of touch is not the main thing even though it can be a powerful way of communicating love and for a baby one of the most comprehensible.